European officials are openly admitting that the two largest banks in Cyprus are "insolvent", and it is now being reported that Cyprus Popular Bank only has "enough liquidity to cover the next few hours". Of course all banks in Cyprus are officially closed until Tuesday at the earliest, but there have been long lines at ATMs all over Cyprus as people scramble to get whatever money they can out of the banks. Unfortunately, some ATMs appear to be "malfunctioning" and others appear to have already run out of cash. 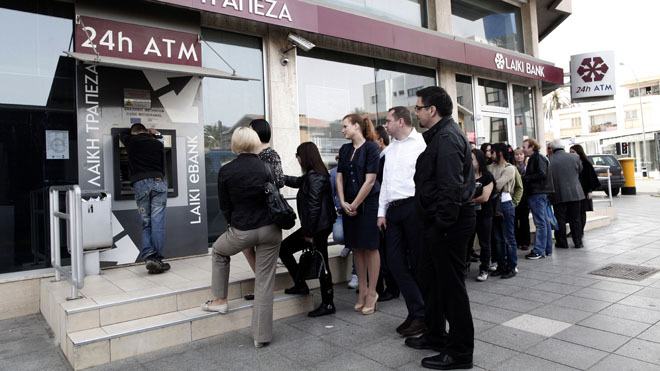 You can see some photos of huge lines at one ATM in Cyprus right here. Some businesses are now even refusing to take credit card payments. This is creating an atmosphere of panic on the streets of Cyprus. Meanwhile, the EU is holding a gun to the head of the Cyprus financial system. Either Cyprus meets EU demands by Monday, or liquidity for the banks will be totally cut off and Cyprus will be forced out of the euro. It is being reported that European officials believe that the "economy is going to tank in Cyprus no matter what", and that it would be okay to let the financial system of Cyprus crash and burn if politicians in Cyprus are not willing to do what they have been ordered to do. Apparently European officials are very confident that the situation in Cyprus can be contained and that it will not spread to other European nations. Unfortunately, European officials are losing sight of the bigger picture. If the largest banks in Cyprus are allowed to fail, it will be another "Lehman Brothers moment". The faith that people have in banks all over Europe will be called into question, and everyone will be wondering what major European banks will be allowed to fail next. Meanwhile, European officials have already completely shattered confidence in deposit insurance at this point. Everyone now knows that when there is a major bank failure that depositors will be expected to share in the pain. Expect to see "bank jogs" all over southern Europe over the coming weeks. Cyprus Popular Bank Pcl (CPB) and the Bank of Cyprus Plc would be split to create a so-called bad bank, one of the officials said. 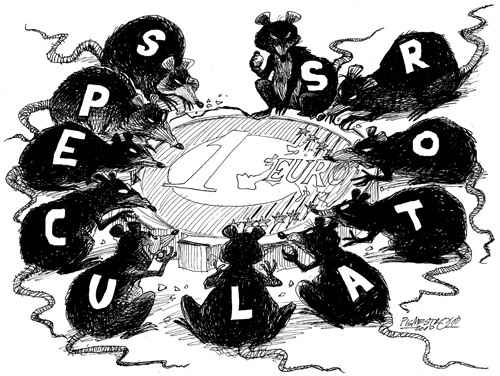 Insured deposits ~ below the European Union ceiling of 100,000 euros ($129,000) ~ would go into a so-called good bank and not sustain any losses, while uninsured deposits would go into the bad bank and be frozen until assets could be sold, said the four officials. According to Greek newspaper Kathimerini, European officials are also openly discussing the possibility of a Cyprus exit from the eurozone if a suitable bailout agreement is not worked out. And European officials are even publicly talking about the possibility that Cyprus will soon need to start using "their own currency". In Brussels, a senior European Union official told Reuters that an ECB withdrawal would mean Cyprus's biggest banks being wound up, wiping out the large deposits it has sought to protect, and probably forcing the country to abandon the euro. "If the financial sector collapses, then they simply have to face a very significant devaluation and faced with that situation, they would have no other way but to start having their own currency," the EU official said. Leaders of Cyprus' political parties agreed Thursday to create an "investment solidarity fund," which would issue bonds backed by state and church assets. The government said a "Plan B" was in the works. In fact, the tone of European officials has noticeably changed from previous bailout efforts. They now seem much more willing to play hardball. For example, just check out what German Finance Minister Wolfgang Schaeuble is saying about the situation in Cyprus. Asked if the eurozone was willing to let Cyprus go bust, he answered: "Well, we are much more stable in the eurozone ~ we took measures to protect ourselves from the risks of contagion ... but I don't want to have any of this." "It is a serious situation, but this cannot lead to a decision that makes absolutely no sense, to rescue a business model that has failed. Cyprus has a banking sector that is totally oversized and this made Cyprus insolvent. And nobody outside Cyprus is to blame for it." Schaeuble knows that the EU is holding all of the cards and that Cyprus is doomed without their help. "The Cypriot state cannot fund itself on the markets. Its two largest banks are insolvent and are being kept afloat with emergency funding from the ECB, but only on the condition that there will be a long-term rescue programme. If this condition is no longer met, Cyprus will no longer be solvent and this is something Cypriot decision makers must know"
But the truth is that the EU can't really afford to allow major banks to fail or for a single member to leave the eurozone. If either of those things happens, the confidence game that has been holding the European financial system together will begin to rapidly evaporate. At least there are a few politicians in Europe that understand what is happening. Nigel Farage, a very outspoken member of the European Parliament, is telling people to get their money out of banks in southern Europe as quickly as they can. He is warning that a great collapse of the European financial system is coming and that people need to get prepared for it.